00 - I select New Data and the first hour of Zack and Wiki begins. 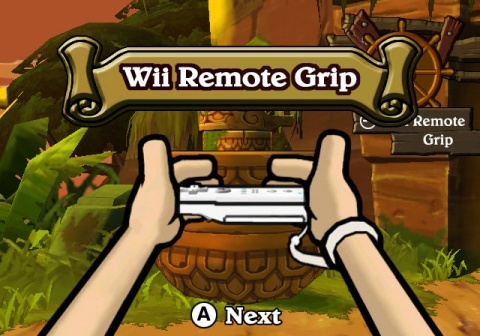 The loading screen says my grip on the Wiimote is key. Some waves start crashing and a bunch of text flies by about a legendary ship. Some sea-worthy music begins playing and our hero appears wearing a giant red hat. 01 - Capcom presents... Zack and Wiki. The credits are appearing as we fly through an expanse of clouds. I will admit, I like the music. 02 - The music gets a bit more serious as a plane flies by, we zip inside of it and there's Zack sleeping. A flying yellow dog turns into a bell and tries to wake him up. He just said "Zakku!" in Japanese. That didn't wake him up though, but then he said something about treasure and that did the trick. 03 - The pilot, Johnny Style says we're approaching the drop zone. There's this obnoxious chewing noise that keeps playing... oh, it's Zack eating a chocolate bar. 05 - I now have control of the Wiimote and can point at things and press A to find out more about them. Pressing the camera icon brings the camera outside the airplane again, we're skimming the clouds. 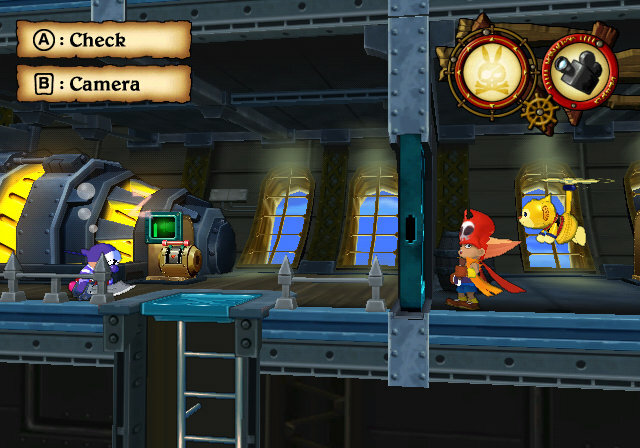 The game has a great cartoony look. 06 - I click the pilot and get 500/500 HiFrameQ...? Oh oh, an alarm is going off now. 07 - Holding B while moving the Wiimote around rotates the camera a bit, nice effect. Puling the camera outside the ship again reveals a very large something right above us! 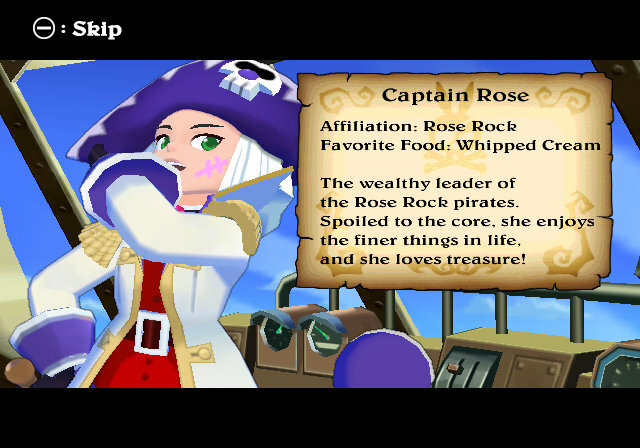 It's the Rose Rock pirates! 08 - The game switches to their view, some woman puts on purple lipstick and smacks her lips. She just drew on her cheek with the lipstick too... Looks like it's a race for some treasure! Or we already have the treasure and they want it. Ha, they're shooting at us! 10 - Some of her minions jump on and start pounding the top of our aircraft. Oh no, Johnny Style ejects out of our plane! 11 - I need to open the rear hatch, I click the lever and the game tells me I have to move the Wiimote just like I would move the object in real life. I give it a pull and receive another bunch of HiframeQ, whatever the heck that is. We jump out just as the airplane explodes! 12 - We're falling to earth now and a bunch of stuff is right next to us in freefall. I can click on them... guess I need to stop our fall somehow. 13 - One of the boxes contains an umbrella, that should do the trick. 15 - Holding the umbrella out in front of me in a first person view, I need to figure out how to open it. The number two is written on it, is that the second step? Nope, Wiki finally tells me I should just hit the 2 button on the controller! 16 - Zack ends up crash landing into a tree but Wiki can just float around for some reason. I have to wildly shake the Wiimote to get him loose. 17 - Ooh, there's some treasure over there! That was simple enough. 19 - Crap, the airplane is about to fall off a waterfall right on us! I click the tree I fell into to try and push it over so we can get off our little island. What the? A centipede has jumped out at us! Wiki tells me to shake the Wiimote, he turns into a bell and the centipede turns into a... chainsaw? Awesome! Make that a centi-saw! 21 - I move the centi-saw in a cutting motion and knock the tree over. A cutscene plays of the airplane taking out the land we were just on, Zack goes back to munching on a chocolate bar. I should note that only Wiki has spoken so far, Zack hasn't said a word. 22 - We head towards the treasure chest to claim our prize, but some spirit is guarding it. Ringing the bell for a few seconds scares it away though! 23 - Zack opens the treasure Zelda style, until he falls into it! Haha, he bursts out holding a golden skull. Stage Cleared! 24 - Now the skull is yelling at us, maybe it's Murray from Curse of Monkey Island? Turns out it is actually Barbaros, from the title of the game. That would probably be a good thing. He wants us to collect the rest of his body to put him back together again. Probably so he can turn into the final boss! 27 - I collected 40000 HQ in that level, wish I knew what that actually was. I'm in Zack's hideout now and have the option to speak to everyone around. Here's the pilot who ditched us, Johnny Style. Well, we're not really mad at him, instead he gives me some info on how I'm doing and how long I've played. 27 minutes of course! 29 - There's an upright casket where Barbaros' body parts will be stored. Looks like... 17 parts total including the head. 31 - The boss of the Sea Rabbits is named Captain Hulk, I click on him and a map appears. The next level is called "Pit of Tragedy," sounds fun! 33 - This stage looks pretty small, I can already see the treasure, though a red door is in the way. 34 - Interacting with the nearby objects gives me some coins, what are those used for? A snake also pops out of a jar and scares Zack. 36 - Well, I can see the key, just don't know how to get it, too high for Zack to reach. Can't Wiki just grab it for me? 37 - I shake a tree near the entrance and some bird just appears out of thin air. That was random. I apparently can't interat with it though. 40 - Oh, of course! I had to use the Wiki Bell to scare the snake. It turns into a Slither Gripper which should help me reach the key. 42 - Yep, very easy to grab now. I put the key into the door and have to turn the Wiimote like I'm turning a giant sized key. 43 - Inside the cave now, Johnny Style pops out and warns me about some spikes. Looks like I need to go back and grab the snake to make it over this pit. I pull on a chain and the entire roof collapses in, giving me easy access to the chest! 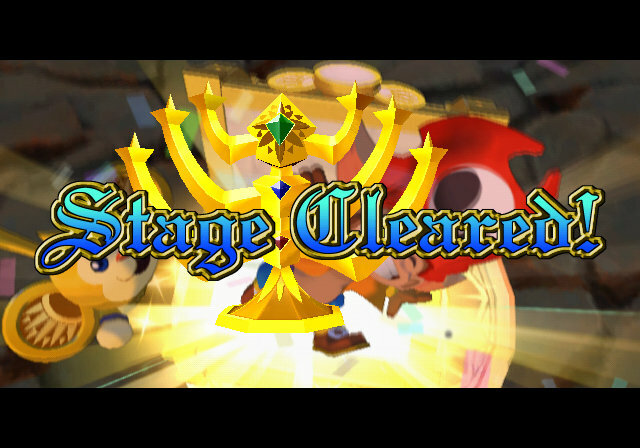 Stage Cleared! I get Barbaros' bracelet, 2 parts down! 45 - I only received 7800 HQ points, I guess that was a really bad score as my message was "Come on, think!" 46 - Some Oracle appears in the hideout and wants to sell me some Oracle Bells and Platinum tickets. She gives me a bell for free and begins a tutorial on how to use it. I guess these are like hints or something for the puzzle I'm currently on. 48 - All right, two levels open up now: "Three Colossi" or "Flute of the Growlin' Goblins." Let's go with the Colossi stage. 49 - This stage isn't much bigger than the last but there are a bunch of contraptions about. Let's start exploring. 51 - There are two heyholes and what appears to be the pieces of anotherk keyhole. I think I have to put this thing together somehow? 53 - I needed to stack three blocks in just the right way, the example was above the keyhole, which really wasn't a keyhole at all. A crank handle pops out as my reward. 54 - LOL, Zack just died. I used the crank on the rightmost "keyhole" and it set off a chain of booby traps that eventually lead to Zack getting rolled over by a red boulder. Poor guy. I have to use a platinum ticket to revive. 56 - The game brings me back to the moment before I initiate my death, and I head to the other crank hole. I need to flip the crank handle over in my hand to make it fit. Kind of ingenius. 57 - This knocks a stone onto the ground which I place on the booby trapped spot... and I get killed again. Lame. Another revive. 59 - All right, did I get it this time? I needed to undo the right crank, raising the treasure back up and stopping the boulder from immediately rolling, then put the totem head boulder on the booby trap spot, then do the right crank again. The boulder rolled passed harmlessly this time! If only Zack had just stepped out of the way earlier. 60 - The final treasure of the first hour is Barbaros' Grauen Goblet! And that's all folks! Gameplay: Seems like there is a bit of trial and error involved in the game, and it's a bit annoying how you actually have a limited number of retries, but I'm excited to see what else Zack and Wiki has to throw at me. I will admit I'm a bit nervous it's just going to be a lot of random waggle to solve puzzles, this was really early on in the Wii's lifecycle so it was still okay to do that then. Fun Factor: Zack and Wiki actually seems like it's hiding a tough game behind the cute exterior! The Wiimote is a pretty natural input device for this type of game and I especially like how there's no nunchuck required. Graphics and Sound: I'll say right off that it's really weird how they left the little Japanese exclamations in the game that Wiki yells out. They're vague enough but said with the appropriate amount of emotion that they don't need to be translated, but from someone who could understand what he was saying it was a bit funny. Graphically the game smartly doesn't go for ultra realistic and instead has a very bubbly look that hasn't aged at all. Story: For a typical point and click adventure game I would expect the story to be the real highlight, but it definitely seems like gameplay is attempting to trump it with its large variety of things to interact with (which is a good thing!). The story is good enough, in my opinion, to keep me interested. Like, what's going to happen when we collect all the parts of this mysterious skull dude? How does Barbaros know Zack already? Would I keep playing? Yes, it's the first non-Nintendo developed Wii game that I actually want to keep playing. 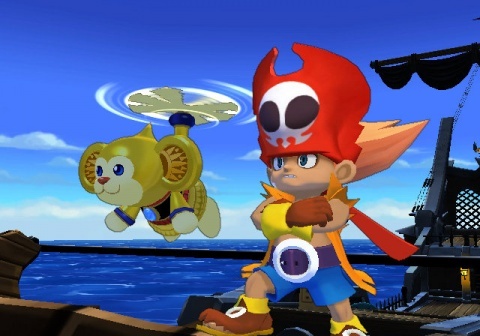 I'm worried about the intermittent waggle that I'm sure the game will require, but I've never played a console point and clicker that feels as good as Zack and Wiki.